A safe and natural alternative to commercial baby oil. This is effective on baby bums, cradle cap, as an all over moisturizer, & can also help to heal sensitive skin, rashes, eczema and more. As you may or may not know, there has been some questionable issues come up around the subject of commercial baby oil and whether or not it’s safe for baby. 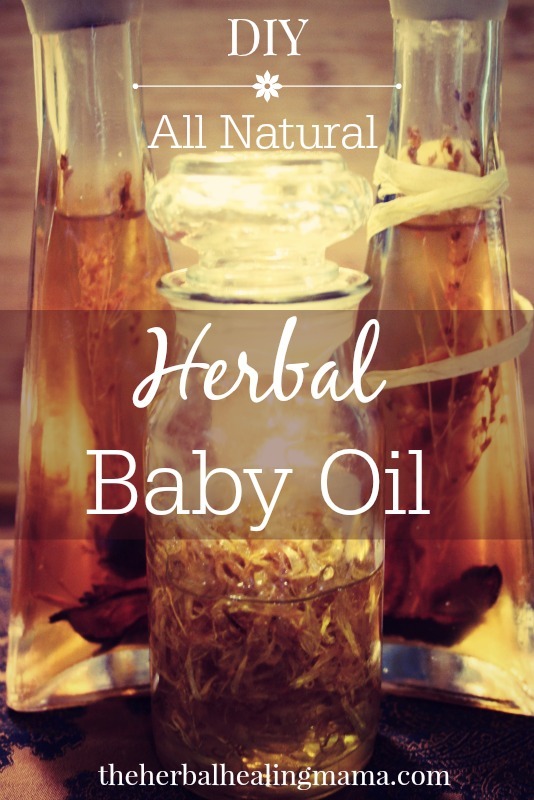 Here is a post from The Holistic Mama on Why you Should Never Use Baby Oil. There are so many different articles that give different opinions and bits of information, I’d suggest you doing your own research and making an informed decision that way. I’ve always been skeptical and tried to avoid using it with my first son, but since I am on this natural journey, I absolutely will not use it on our new babe. I will be making and using this instead. The typical ingredient list on the back of baby oil is: Mineral Oil (huile minérale), Parfum. When is parfum ever a good thing in products? Especially for those of us with sensitive skin issues. Chamomile is gentle and soothing as well as anti-inflammatory, calendula is a wonderful all-purpose healer. It has many healing benefits including skin regenerative properties. Fill the jar enough to cover the herbs with Fractionated Coconut Oil. You could also add some Jojoba oil as well. Seal the jar with an airtight lid or cork. Leave the jar to brew on it’s own, best in a sunny windowsill. Shake jar every few days – checking the scent / strength of the oil, straining and replacing herbs if a more powerful strength is desired. Usually allowing to brew 1-2 weeks or more. Strain out the herbs, reserving the oil using cheesecloth or a fine screen strainer & store in jar. Store in a dark cool place / in a dark bottle or depending – in the fridge. Please see our post Infusing Your Own Oils for more extensive instructions. I recommend Mountain Rose Herbs & Starwest Botanicals for all of your herbal healing needs! Harmonious Mind is also a great Canadian supplier of essential oils and other great things. You can purchase any extra supplies over at Amazon.ca. Images Edited using PicMonkey. Some of the links here are affiliate sites, meaning if you make a purchase using my link, I earn a small commission! Thank You for supporting The Herbal Healing Mama. & Please also see my disclaimer. Thanks Friends.